And the deal is back. Here is the listing you can find it at. For you, just for you, we have a little deal that can turn your frowny emoji face into a wide-grinned emoji face. Or droid face, whichever floats your boat. 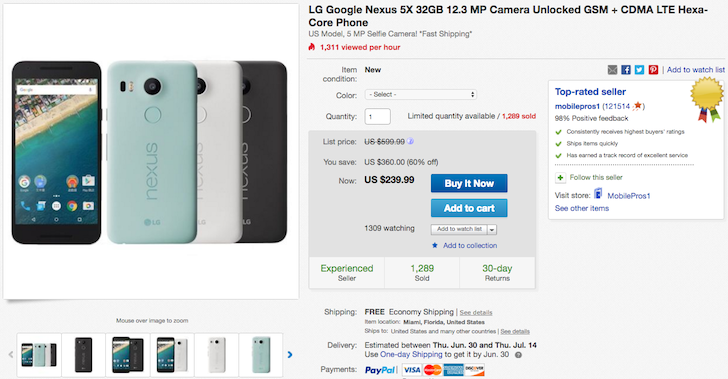 There's a top-rated seller on eBay offering the 32GB Nexus 5X for just $239.99. That might be the lowest price we've seen the handset at — the 16GB version went for $229.99 ten days ago, and we considered that a good deal, and the 32GB version has been down to $269.99 on B&H recently and $239.99 on eBay in March but that last one was the H791 International version which lacks a few LTE bands. This deal we're talking about here is the H790 variant, which should be compatible with all US operators, including GSM and CDMA ones. It's also a completely new boxed item with the original unopened packaging and accessories. Shipping is free in the US (taxes only in Florida), but the seller will ship to plenty of other countries too. You may need to pay though.